Almerindo Gerard Portfolio, M.D. 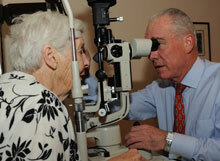 is a respected and experienced eye surgeon who has been in practice for three decades. He received his medical degree from Jefferson Medical College in Philadelphia, in 1978. After serving as an intern at nearby Bryn Mawr Hospital, he moved to New York, where he was a resident at New York University Medical Center. Today, he leads the private practice which his father founded in 1956, and which he joined in 1982. His office is in Glen Rock, NJ. Additionally, he serves as Attending Surgeon at New York Eye and Ear Infirmary, and as Clinical Assistant Professor of Ophthalmology at New York Medical College. He is the former Associate Director of Ophthalmology at Valley Hospital in Ridgewood, NJ. Whether you are considering LASIK or cataract surgery, or you just need to schedule a regular eye exam, Dr. Portfolio can help you see better. For years, he has relied on the good recommendations of his patients as his best advertising, and as a result his practice has thrived. Call Dr. Portfolio’s office today to schedule an appointment.